The restoration and design of new windows for churches etc. 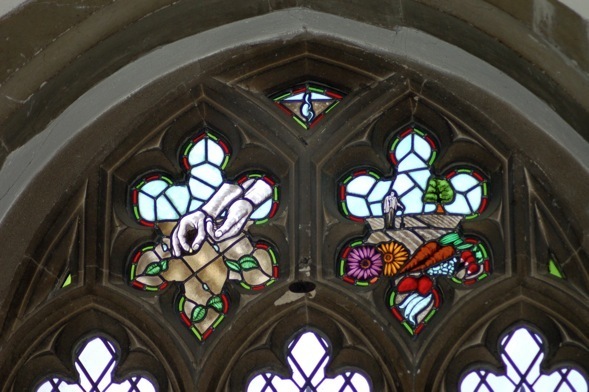 requires a mastery of all the stained glass and painting/ firing techniques previously described along with the skills to properly remove damaged panels and refit completed work. The stone frames found in many churches make this a particularly intricate task. With well over 20 years experience you can trust us with your antique panels or new project. We can also supply and fit security protection for your stained glass. This primarily involves using discreet metal grilles or clear polycarbonate sheets to stop attack and thrown objects. Prevention is better than cure.